The Earth Dollar changes everything! In the blockchain industry, if we do not like or agree with the direction the original blockchain is headed, we can clone and create our own blockchain, which we call forking. The founders of the Earth Dollar was not satisfied with the UN Sustainable Development Goals, so we decided to hard-fork the SDG to created our own version, which we called the Enhanced Sustainable Development Goals (“Enhanced SDG”). The founders of the Earth Dollar envision living in a world where all beings on this great planet are able to thrive, not just sustained. While the UN’s 17 SDGs are a good starting foundation, it only represents a minimum viable survival standard. There is a fundamental difference between thriving and surviving. Surviving means, “to continue to live or exist,” while thrive can be defined as “to grow or develop well, to prosper or to flourish.” So, therefore, the founders have “enhanced” the United Nations’ Sustainable Development Goals to support our vision of a thriving world. Thriving happens when people have a life of purpose, abundance, vitality, prosperity, connection, and celebration. People who are thriving wake up every day excited, full of joy and happy that they are alive. Following the style of the blockchain industry, we forked the SDGs and enhanced it to create the Enhanced Sustainable Development Goals. Since the Earth Dollar is not part of the United Nations, this allows us more flexibility in terms of working with organizations to help achieve our Enhanced Sustainable Development Goals. Fulfilling the Enhanced SDG is not only our duty, but our moral obligation towards all future generations. 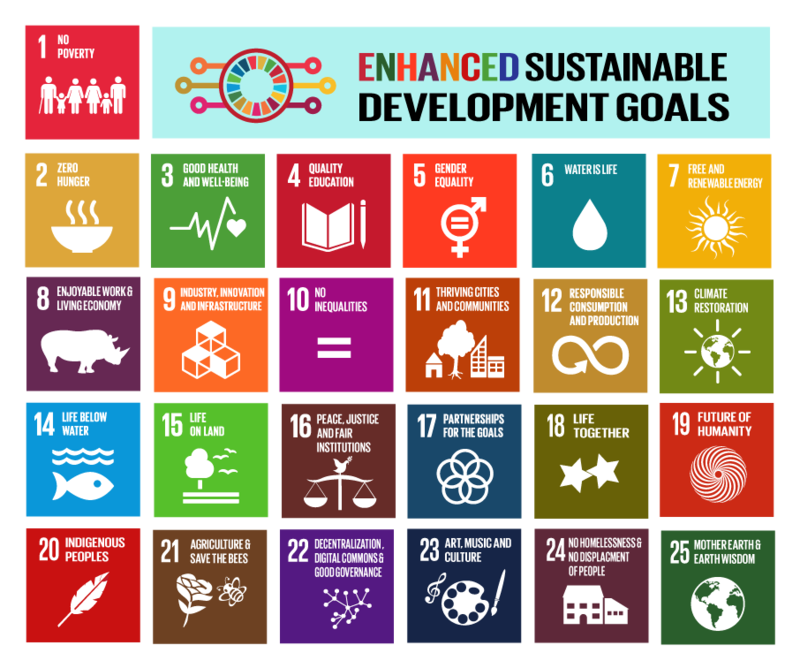 What is different about our Enhanced SDG? The original “Goal 7: Affordable and Clean Energy” of the United Nations has been changed in the Enhanced Sustainable Development Goals to “Goal 7: Free, Affordable, Renewable and Clean Energy”. We added Free and Renewable Energy because this is an important technology that can free humanity. This includes using wind, solar, hydrogen, geothermal, seawater, hydroelectric, airwaves, and biomass. The original “Goal 7: Affordable and Clean Energy” of the United Nations has been changed in the Enhanced Sustainable Development Goals to “Goal 7: Free, Affordable, Renewable and Clean Energy “. We added Free and Renewable Energy because this is an important technology that can free humanity. This includes using wind, solar, hydrogen, geothermal, seawater, hydroelectric, airwaves, and biomass. Goal 8 Enjoyable Work and Implement the Living Economy The original “Goal 8: Decent work and economic growth” of the United Nations has been changed in the Enhanced Sustainable Development Goals to “Goal 8: Enjoyable Work and Implement the Living Economy”. We upgraded Goal 8. While Decent Work is a minimal standard, Enjoyable Work is the highest standard we can achieve in the work environment. Also, Economic Growth has been changed to Implement the Living Economy, a new economic system centered on the preservation of all life on the planet. New wealth is generated as the Earth is being restored. The United Nations has called for 7% GDP growth per annum in the least developed countries and higher levels of economic productivity across the board, which is contributing to the destruction of our planet. This is totally unsustainable. The core of the United Nations’ SDG programme relies on the old paradigm model of indefinite economic growth that caused our ecological crisis in the first place: ever-increasing levels of extraction, production, and consumption. This is a profound contradiction to the heart of these supposedly sustainable goals. They call for both less and more at the same time. Currently, global production and consumption levels are overshooting our planet’s biocapacity by nearly 60% each year. In other words, growth isn’t an option anymore – we’ve already grown too much. Scientists tell us that we are blowing past planetary boundaries at breakneck speed and witnessing the greatest mass extinction of species in more than 66m years. The hard truth is that our ecological overshoot is due almost entirely to over-consumption in rich countries, particularly the West. The Earth Dollar team has adopted the Implementation of the Living Economic System. The Living Economic System is a new economic system that is centered on the preservation of life and does not need to generate wealth from infinite economic growth or GDP. New wealth is generated by restoring the Earth, thus the Living Economic System is able to both lift millions of people out of poverty while restoring the Earth, thus can quickly fulfill all 21 Enhanced SDGs in a short time. The original “Goal 10: Reduced Inequalities” of the United Nations has been changed in the Enhanced Sustainable Development Goals to “Goal 10: No Inequalities”. We upgraded Goal 10. While Reduced Inequalities is a minimal standard, No Inequalities is the highest standard we can achieve, with the goal of eliminating all inequalities. The original “Goal 11: Sustainable Cities and Communities” of the United Nations has been changed in the Enhanced Sustainable Development Goals to “Goal 11: Thriving Cities and Communities”. We upgraded Goal 11. While Sustainable Cities and Communities is a minimal standard, Thriving Cities and Communities is the highest standard we can achieve. There is a fundamental difference between thriving and sustainable. Sustainable means, “able to be maintained at a certain rate or level,” while thrive can be defined as “to grow or develop well, to prosper or to flourish.” So, therefore, the founders have “upgraded” the United Nations’ Sustainable Development Goals to support our vision of a thriving world. Thriving happens when people have a life of purpose, abundance, vitality, prosperity, connection, and celebration. People who are thriving wake up every day excited, full of joy and happy that they are alive. 16. Peace, Justice, and Fair Institutions We change the United Nation’s SDG of “Strong Institutions” to “Fair Institutions”. A strong institution can be a dictatorship, but not necessarily fair. This new SDG for the Future of Humanity is a collective leap in consciousness. We are creating ‘Moon Shots’ to collectively awaken to our greatest selves in service to the collective whole. This new SDG was proposed by Gail Davvis because she felt it was important to be able to live in harmony with one another. Being able to live in harmony with one another is the basis of all good relationships. We added the Indigenous Peoples Rights in the Enhanced Sustainable Development Goals because indigenous peoples and indigenous nations are often left out of the United Nations system. Furthermore, Indigenous Peoples rights are enshrined in the United Nations’ Declaration of the Rights on Indigenous Peoples (UNDRIP). Often they have been colonized, exploited, prosecuted, jailed and even killed in the process of defending their rights. The Earth Dollar would not exist if not for the indigenous people’s involvement in the Earth Dollar, which is seeding Earth Dollar. We added the Sustainable, GMO-Free and Chemical Free Agriculture in the Enhanced Sustainable Development Goals because agriculture is so important to many of the goals and specifically to Goal 1: No Poverty and Goal 2: Zero Hunger. With our current understanding of science, researchers and the general public are starting to understand the implications of genetically modified organisms (GMO) and chemicals such as pesticides on the long-term health of the human body. This includes the higher risk of diseases such as cancer. The Earth Dollar, therefore, supports organic farming and farmers. This includes saving the bees to ensure a safe and abundant food supply. We added Decentralization, Digital Commons and Good Governance in the Enhanced Sustainable Development Goals because blockchain technology allows for decentralized governance and for people to have a direct vote in decisions that affect their lives. Furthermore, the Digital Commons is becoming more prevalent in our daily lives, such as the Internet, text messenging, video calling, social media, virtual reality, games, augmented reality and more, The old model of government knows best is not working and the Earth Dollar is supporting the testing of new governance models, such as Liquid Democracy. The Earth Dollar is also advocating Good Governance that works for the welfare and the wellness of people and planet. Good Governance supports the entire citizenship instead of working for a few people and to ensure that nobody is left behind. We added this new SDG because we felt that it was important not to leave out a huge portion of the population that is using creativity to make the world a better place. We added this new SDG because food, clothing and shelter is one of the basic securities of life. We believe that everyone deserves a comfortable and secure home. This new SDG gives people peace of mind knowing that they have somewhere to live and call home. We added the Rights of Mother Earth in the Enhanced Sustainable Development Goals because we only have one planet and if Mother Earth is destroyed or degraded, achieving any of the other SDGs would not be possible. Mother Earth sustains all life and needs to be protected through legal rights. The Earth Dollar is planning to adopt Our Mother Earth Constitution as part of Goal 0, which includes the Universal Declaration of the Rights of Mother Earth. We also added Earth Wisdom as wisdom derived from natural law and nature.